Buruji Kashamu, the Ogun east senator, wanted in the United States, may appear to be a tough guy, mounting a labyrinth of legal obstacles, to stall the moves by the National Drug Law Enforcement Agency to ship him out to Chicago. But we can report today that Kashamu is also a faint-hearted person, not willing to take any risk about his life. 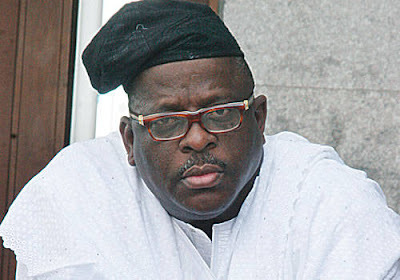 Kashamu was billed to travel to Abuja from Lagos today, after he failed to commit the office of the Attorney-General of the Federation and the NDLEA for criminal contempt over extradition moves to the USA. He had sat in the Business class of Aero Flight 127, Abuja-bound, along with his lawyers when the captain announced a minor problem with the plane. The captain said the light of an indicator had not come on brightly enough and that the Aero engineers are fixing the problem. To keep the passengers at ease, the captain gave the assurance that the problem was nothing to worry about. And that the resolution of the problem will not take three minutes. No sooner the captain finished talking, than Kashamu signalled to his lawyers, asking them to alight from the plane. Other passengers who had calmly listened to Captain Kunle’s explanation remained glued to their seats and burst out laughing when Buruji and his lawyers scampered away. Aero Flight 127, which left Lagos at 14.45 landed in Abuja without incidents.